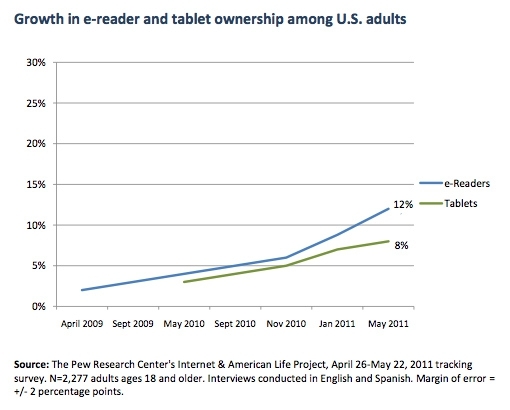 "The share of adults in the United States who own an e-book reader doubled to 12% in May, 2011 from 6% in November 2010. E-readers, such as a Kindle or Nook, are portable devices designed to allow readers to download and read books and periodicals. This is the first time since the Pew Internet Project began measuring e-reader use in April 2009 that ownership of this device has reached double digits among U.S. adults." I'm betting the deep discounts in e-book readers such as the Kindle have a little to do with this, as you can see the growth of those types of hardware are outpacing the growth in the tablet sector. Further down in the survey the real surprise is that laptops are almost even with desktops when it comes to the number of adults that own them, 56% for laptops versus 57% for desktops. Personally I'm surprised that it took this long to catch up but I have always preferred a laptop for convenience and haven't done all that much in the "power user" realm such as video editing, etc. As far as what I own, it's one of everything except for the desktop, how about you?